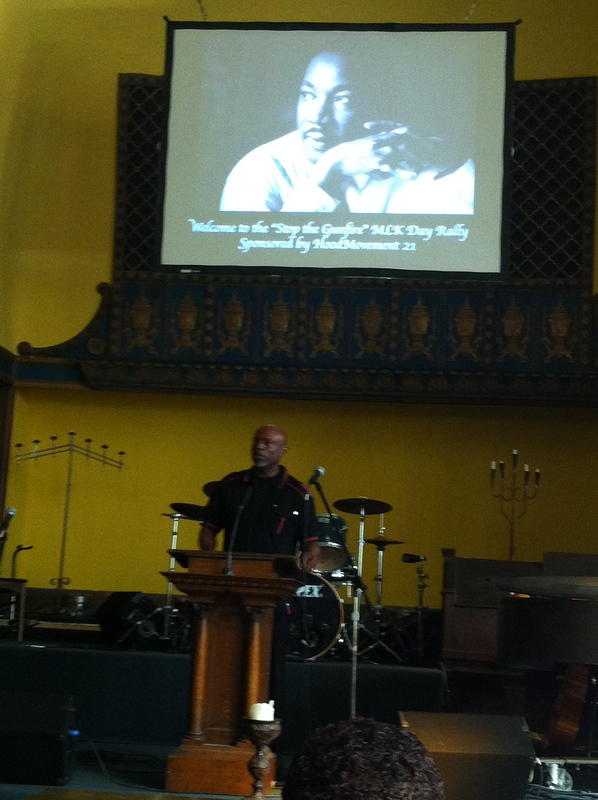 Oakland residents honor MLK by gathering to stop the violence. This is a common utterance that is heard by activists that speak about youth..yet you wouldn’t know it by looking at the violence that has occurred in Oakland this past year. Three babies under the age of 5 were fatally shot due to gun violence. As of October 2011 the number of homicides in Oakland was at 94. I don’t know how many other shootings occurred during the holidays. 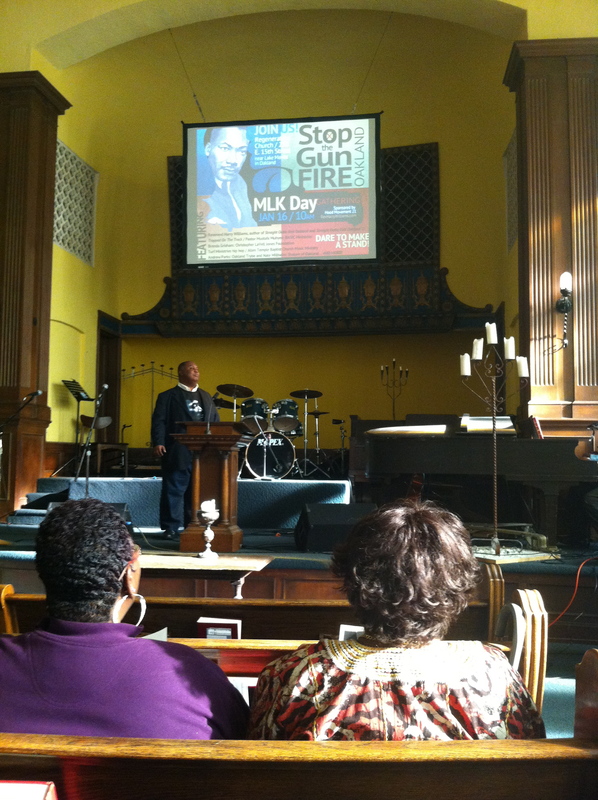 Today Regeneration Church and Reverend Harry Louis Williams II, hosted “Stop the Gunfire- MLK Day Gathering 2012” a grassroots program hoping to find a solution towards reducing the violent crimes in Oakland. Attending by over a 100 civic leaders, activists and residents, presenters pleaded with participants to gather together as a community, put our arms around our youth and pray for peace in order to make a change. This event was heavily influenced by Christianity and a belief that Jesus Christ is the answer to the crisis we are facing. ..
Rev. 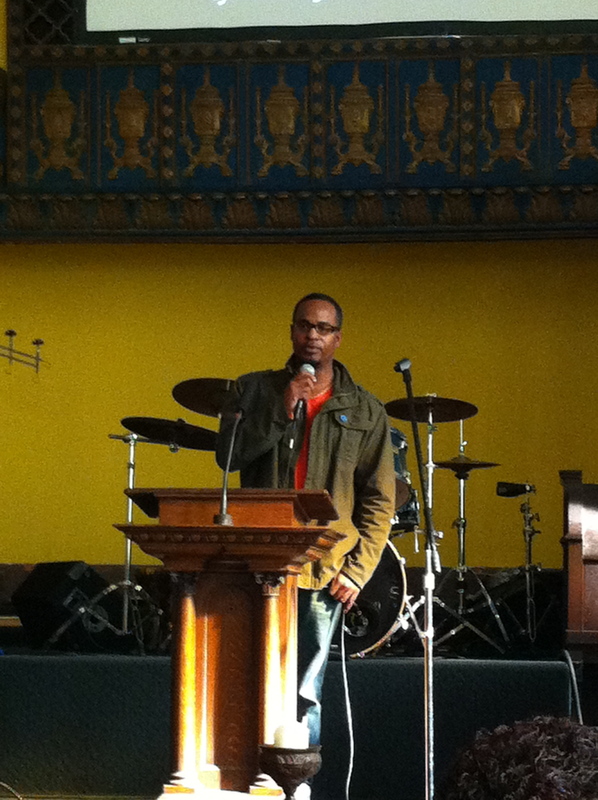 Harry Louis Williams II kicks off the "Stop the Gunfire - MLK Gathering 2012"
One of the speakers, whose name I did not catch, started out the event by recalling the story of Cain and Abel. He said when Cain killed his brother Abel, God heard the blood of his brother cry out to Him. 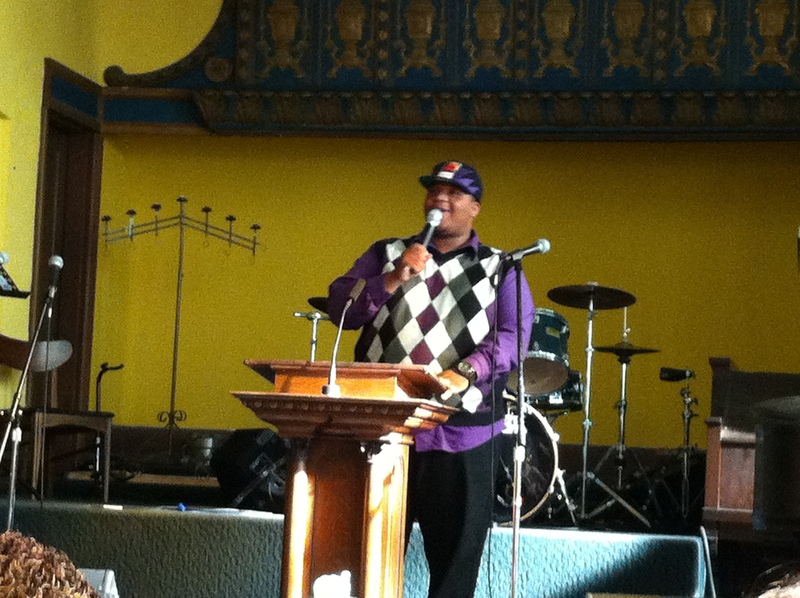 The speaker then asked if God was to put his ear towards the streets of Oakland, what would he hear? Following that opening, guest speakers like Councilmember Pat Kernighan, family members of slain children, and local activists like George Galvis (who fought against gang injunctions) came to speak, sing, and recite poetry for 5 minutes on what they are doing to make our city a better place to live. Pastor Mustafa Muyhee of BASIC Ministries told us that MLK brought change as an answer to the problems they faced in the past. It was the gospel of Jesus Christ that gave him the power to make change. “Only Jesus can change the heart of a murder” said Muyhee who confided that 10 years ago he used to be a murderer. He said those that know Jesus need to bring the gospel to the murderers, prostitutes and drug dealers..so that they can turn their lives around like he did. Nola Grant, Executive Director and Founder of MISSSEY (Motivating, Inspiring, Supporting and Serving Sexually Exploited Youth) says that violence starts before it gets to the street. It stems from domestic violence witnessed in the home, poverty, drug use ..and those examples are just the beginning. We need to start looking deeper. We need to identify the problem so that we can turn to a solution that does not involve violence and anger. Finally, yes we need to come to GOD for prayer and answers, however God’s work is not done inside the church walls. Through sacrifice and giving up something of ourselves, we should go outside of the church walls and make change in our community. There were many more presentations and stories shared during the program that would make this blog post too long to cover..
Elaine McIntyre, a local artist who sang a lovely inspirational song. There was even a team of students from the School of Urban Missions (Sobrante Park) there to pray for you. The program ended with a free lunch and an opportunity to visit community organizations sharing information about their work. Take the time to visit their websites and learn more about how you can help them fight violence in the streets. As I left the church to head home, I noticed a little boy, no more than five, running in and out of the church, laughing and interacting with people while his parents were networking outside. He was comfortable and unafraid..knowing that he was perfectly safe to roam freely. Hopefully with more events like these, we can work together to make sure that all the children of Oakland can have that same kind of freedom. 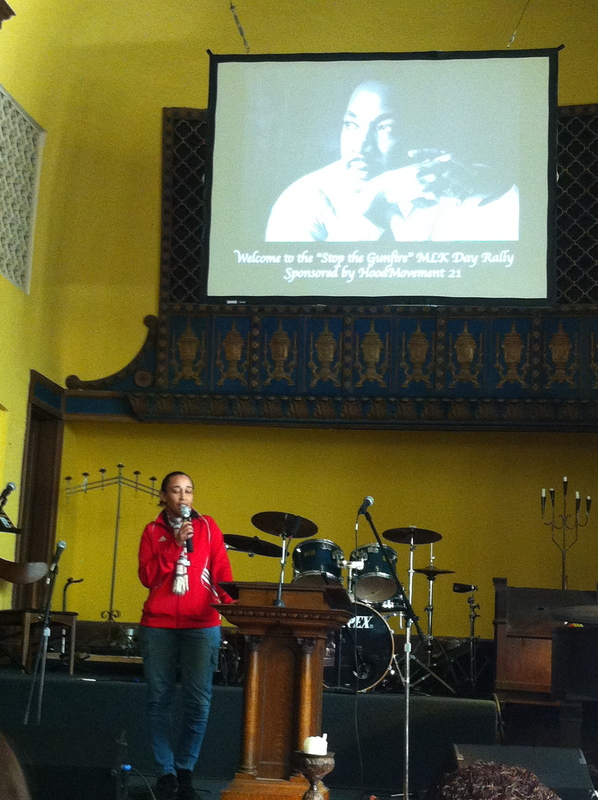 5 Responses to Oakland residents honor MLK by gathering to stop the violence. 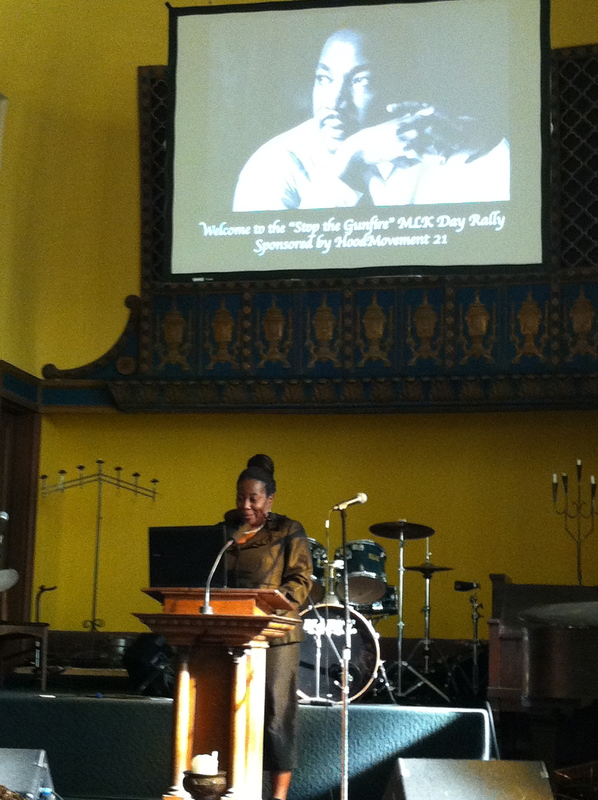 I was only there for a little while (I was covering a variety of MLK Day events), but what I heard was inspiring. The message of Brenda Grisham was particularly inspiring. Yes, especially when she put the laptop away and started speaking from the heart. She said she was nervous, but she was very compelling. 1000 Mothers to Prevent Violence Mourning Mothers Walk is on May 5, 2012 at the San Leandro Marina (not May 15th). Please join them! It’s going to be GREAT!